The Wehrmacht was the unified armed forces of Germany from 1935 to 1945. It consisted of the Heer (army), the Kriegsmarine (navy) and the Luftwaffe (air force). The term Wehrmacht is in Article 47 of the 1919 Weimar Constitution, establishing that: Der Reichspräsident hat den Oberbefehl über die gesamte Wehrmacht des Reiches (“The National President holds supreme command of all armed forces of the nation”). From 1919, Germany’s national defence force was known as the Reichswehr, until its renaming as Wehrmacht in 1935. The medal featured here is a military long service award for serving a total of 12 years. The ribbon is dark blue. Solid color. 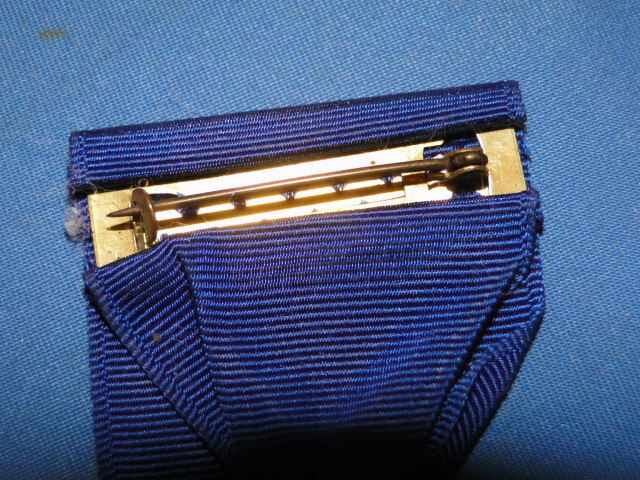 The upper section in the back has a metal rectangular plate which holds the pin and catch that allows the medal to be attached to the uniform. 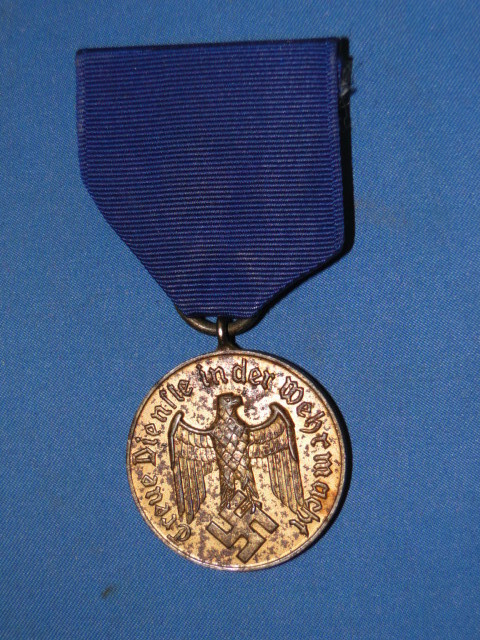 The medal displays a Wehrmarcht eagle in the front. The phrase "Treue Dienste in der Wehrmacht". 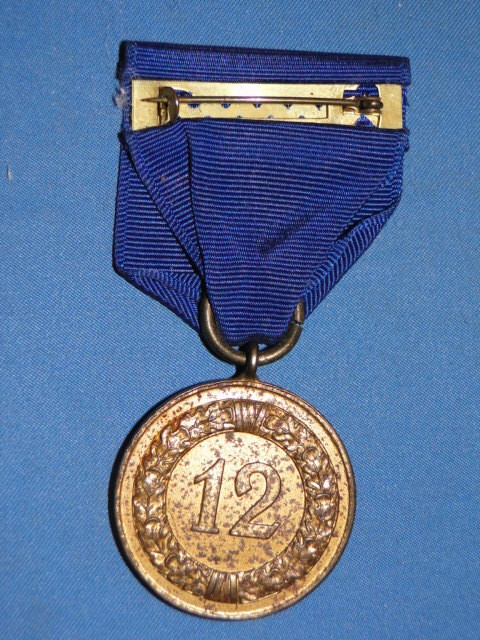 The reverse shows a wreath with the number 12 in the center. This page is a recognition and identification guide for WWII German medals and ribbons. Multiple detailed photos of a specific sample are provided. Descriptions point out clearly defined points that should be noted. One of the most commonly asked questions is "How much is my WWII German award worth?". A price guide is included here to address this question. The value of the medals and ribbons is reviewed over a period of several years. A trend can be observed. The present worth of the German awards in the collector's market is illustrated.